The Clintons Were Here. So Were the Obamas. It’s August, which means one thing on Martha’s Vineyard: President Barack Obama and his family will be touching down soon for their annual island getaway. 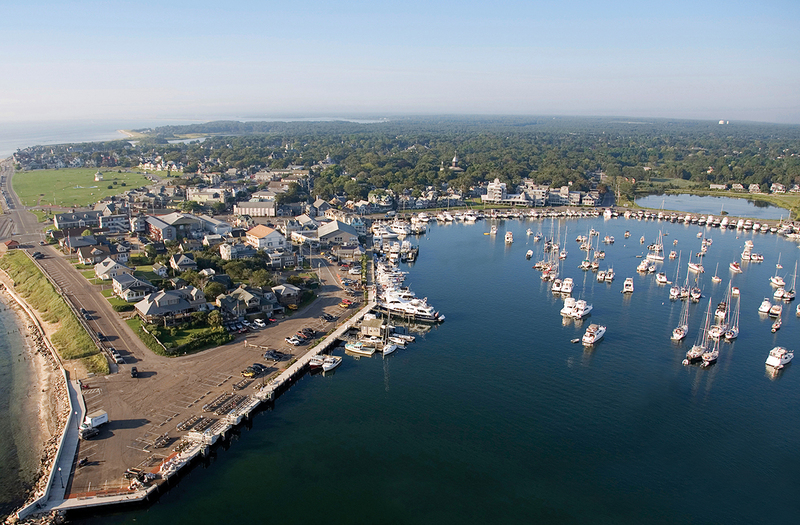 As in years past, they’ll likely enjoy a romantic dinner at the Beach Plum Inn, slurp ice cream cones at Mad Martha’s, and bike at water’s edge while the pesky press corps snaps photos for the world to see. But 2016 will be bittersweet, as it will be Obama’s last vacation on the island while in office. Over the past 20 years, Vineyard locals have had the unique privilege of hosting two presidential families: first the Clintons, then the Obamas, who bring with them not only excitement but also Secret Service–flanked motorcades, state police choppers, and relentlessly snarled traffic. Will 2017 bring the Clinton family back for another presidential stay, this time with Hillary as vacationer in chief? Only November will tell. In the meantime, we reminisce about all the ways our former heads of state have made this tiny slice of paradise their chosen summer retreat. They bike without a helmet. 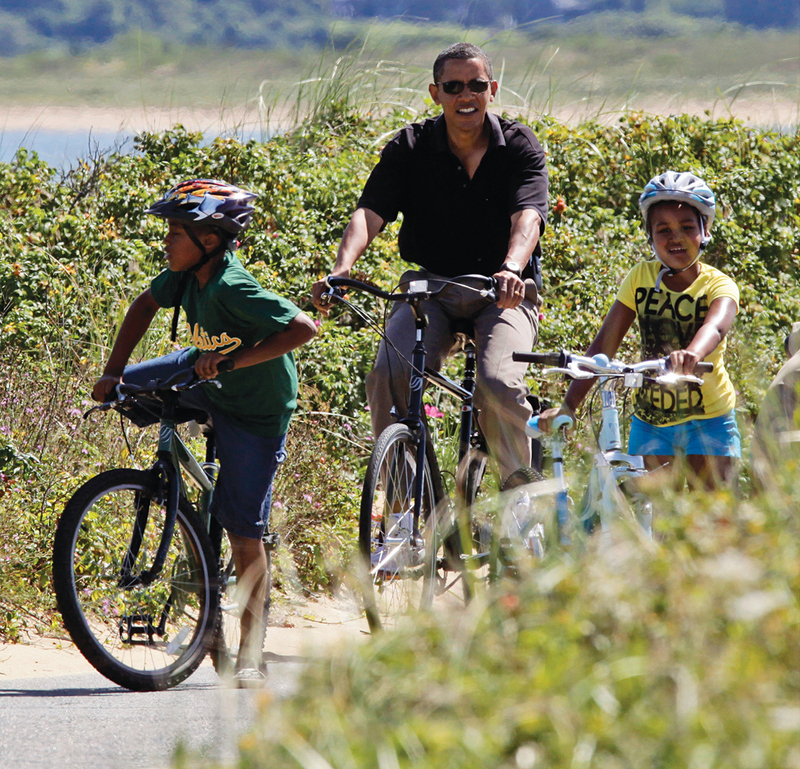 It was the snapshot seen ’round the world: Obama, donning a polo shirt and flanked by daughters Malia and Sasha, cycling around the mean streets of Martha’s Vineyard sans head protection in 2009. The horror! Parenting websites, newspapers, even the International Bicycle Fund weighed in, demanding the president set a better example for pedal-pushing kids and adults alike. The dustup drew such ire that it elicited a statement from former White House spokesman Bill Burton, who remarked that Obama “supports the wearing of bicycle helmets.” Just not while on the Vineyard, apparently. Finding a few good men to round out a foursome is no problem when you’re the president. In recent years Obama has gone stroke for stroke at Farm Neck Golf Club with NBA stars Steph Curry and Alonzo Mourning, and teed off against comedian Larry David and billionaire Glenn Hutchins. 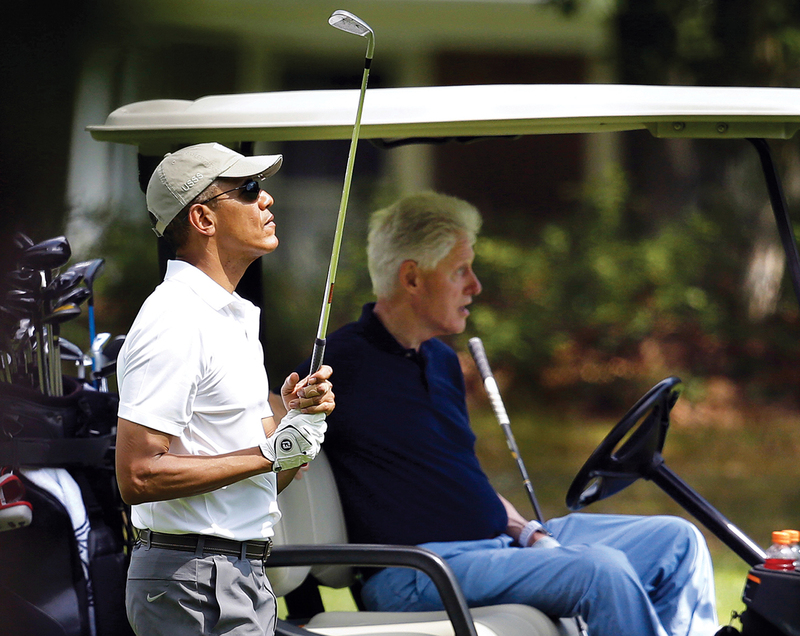 No 18 holes, however, were as memorable as when Obama was joined by Bill Clinton in the summer of 2015 at Farm Neck. Both men have received glowing reviews on the links: Golf magazine once lauded Obama for his “controlled and focused” backswing and said that Clinton is “not leaving anything in the bag” when he wields a driver. Rumor has it Obama emerged victorious. Either way, we want to see a rematch. They kick back at luxurious private homes. In the summer of 1874, President Ulysses S. Grant arrived on Martha’s Vineyard, parked his bags inside a gingerbread cottage on Ocean Avenue, and enjoyed a fireworks display from the roof. Flash-forward 142 years, and the island’s summer White Houses have gotten a little more secluded and a lot more plush: Boasting serious square footage and endless amenities, these former presidential hideaways have offered plenty of room for rest, relaxation, and the occasional security briefing. Rent: Free. Friedman—a major Democratic fundraiser—is a dear Clinton friend. Bedrooms: Four-bedroom main house; one-bedroom guest house. Rent: Up to $50,000 per week. Hey, no one said Obama was a cheap date. Bedrooms: Three-bedroom main house; five-bedroom guest house. Luxe Amenities: A basketball half court, a par-3 golf course, a climate-controlled wine cellar, and a private beach. access. 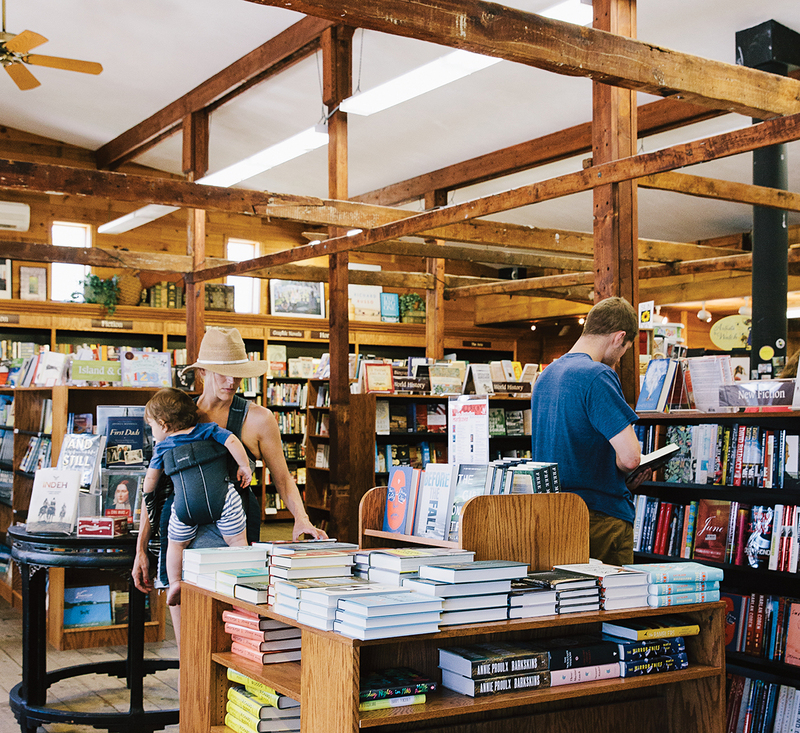 They expand their literary collection at the island’s indie bookstores. John Adams—whose 3,500-tome stockpile is enshrined at the BPL—may have been our country’s first bookworm president, but our national pastime of dissecting what’s on the White House nightstand was perhaps first sparked by JFK, after he divulged a fondness for Bond novels. Now, every summer, we gleefully riffle through POTUS’s beach bag to inspect his literary picks. On his holiday last year, the media noted that Obama brought six books with him—including Ron Chernow’s George Washington biography—and stocked up on more at the Vineyard Haven bookshop Bunch of Grapes (pictured). His first vacation stop in 2010 (yes, even before the golf club), the store gifted him a copy of Jonathan Franzen’s Freedom 11 days before its official release date. But Obama wasn’t the first president to check out MV’s literary scene: Voracious reader Bill Clinton was a regular at both Bickerton & Ripley Books (now Edgartown Books) and Bunch of Grapes, even returning to the latter to sign some 900 copies of his memoir, My Life, in 2004. They have muffins and margaritas made especially for them. The first summer the Clintons visited the Vineyard, Carol McManus, owner of the Edgartown coffee shop Espresso Love, left a special treat out on a pedestal each day with a note: “Save for Bill.” It was her Presidential Muffin—baked with cream cheese, strawberries, and blueberries—and though Bill didn’t get to sample it on that trip, his second Vineyard vacation brought a surprise. The morning after the Clintons touched down, a mysterious woman walked into Espresso Love. “She says, ‘I’m from the White House and we would like to try some of your baked goods to take back to the president and first lady, and if they like it we’ll place an order for them every morning,’” McManus recalls. A week later, the Clintons, on a bike ride, paid a visit to the shop themselves. Hillary was wearing a “Bad Hair Day” hat; daughter Chelsea was with a friend. “The president said to me, ‘I wanted to meet the lady who was doing the baking for me,’” McManus says. 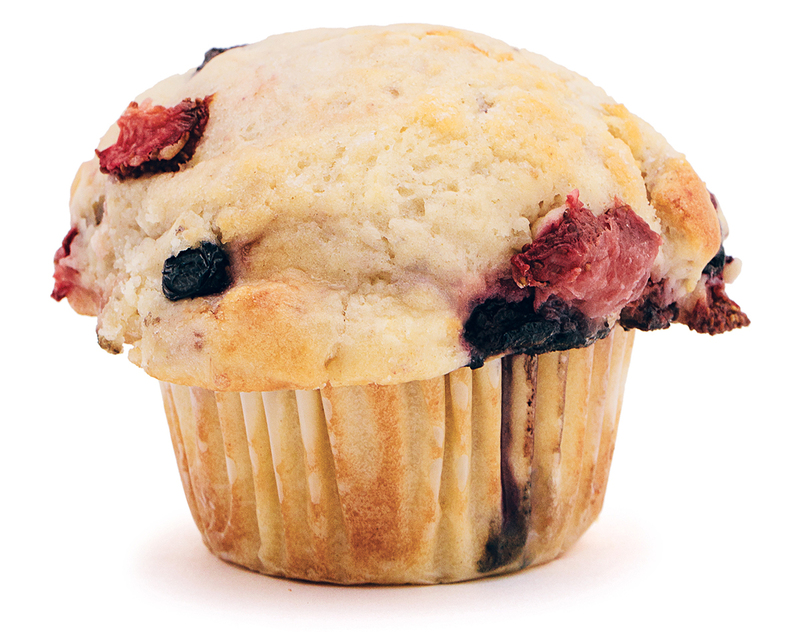 Twenty-three years later, the Presidential Muffin is still on the menu. As it turns out, naming a recipe after POTUS can be very good for business—see: the Obamarita at Sharky’s Cantina, the Barack My World ice cream at Mad Martha’s. And pretty darn tasty, too. They cruise with the Kennedys. “August 1998 was a bloody month,” Hillary Clinton wrote in her book Living History. Terrorists bombed two African U.S. embassies; meanwhile, the Lewinsky scandal was reaching fever pitch. “The last thing in the world I wanted to do was go away on vacation.” Nevertheless, the Clintons set off for the Vineyard. 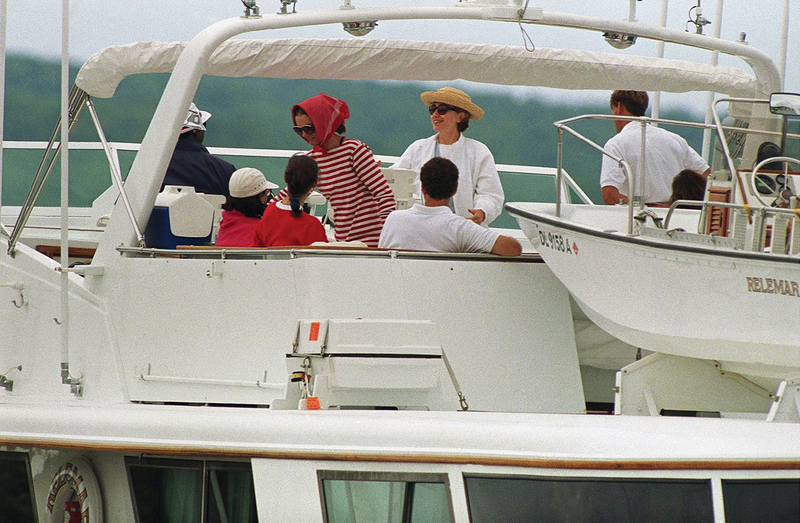 Their getaway included a trip aboard the Relemar, whose owner—Jackie O. companion Maurice Tempelsman—offered Hillary marital advice while Bill stayed in the proverbial doghouse with their Lab, Buddy. But that was not their maiden voyage: In 1993 Senator Ted Kennedy took the family for a ride, enjoying a swim with Bill while Hillary, Chelsea, Jackie, and Caroline traded war stories about raising (or growing up as) a teen in the White House. They cast a line—or not. Back in the 1800s, presidents Chester A. Arthur and Grover Cleveland got the chance to bait their hooks in Vineyard waters. Will Obama follow in their footsteps on his final presidential visit? Buddy Vanderhoop hopes so. The Tomahawk Charters captain has helped plenty of celebs reel in whoppers, but he’s yet to land a first family. He came close with the Clintons, but they had to abandon ship after the death of Princess Diana, and Obama has canceled a few times, too. But Vanderhoop says plans to take the president out this year are well under way, thanks largely to Harvard Law professor Charles Ogletree, a mentor of both Barack and Michelle who frequently charters his services. According to Vanderhoop, there’s a big upside to having a president aboard: “I will tell the Coast Guard and Secret Service where I intend to fish, and there won’t be another boat allowed within a mile and a half. The fishing will be awesome.” So long as Obama shows up. They play in the surf. JFK may have been on the Harvard swim team, but it appears his wife also liked to make a splash. 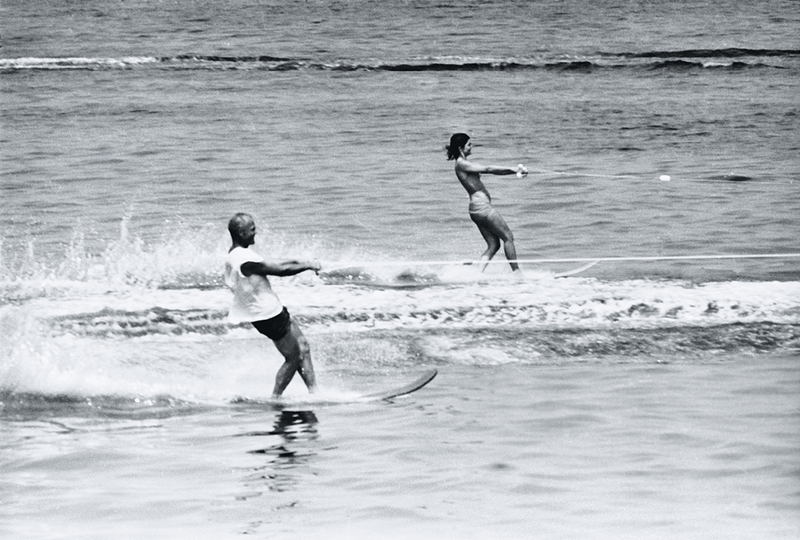 First lady Jackie Kennedy relished the sport of water-skiing, gliding next to astronaut John Glenn near the family compound in Hyannis Port one summer. In 1961, in fact, she even made an appearance on the shores of Martha’s Vineyard. As the family cruised aboard the Marlin over to Chappaquiddick Beach Club, Jackie, in an aqua bathing suit and a white-petaled swimmers’ cap, according to the Vineyard Gazette, spotted a Boston Whaler towing a teenager on water skis. Soon, Jackie herself was the one hooked up to the boat. “She was expert at the sport,” noted the Gazette, “taking two big swoops and dropping off quite a way out to swim back”—all under the close watch of Coast Guardsmen, of course. From actors to professional athletes, the Vineyard has long been a magnet for A-list vacationers. So it’s no surprise that in between quiet times with the first family, presidents Clinton and Obama have been known to mingle with fellow bigwigs. 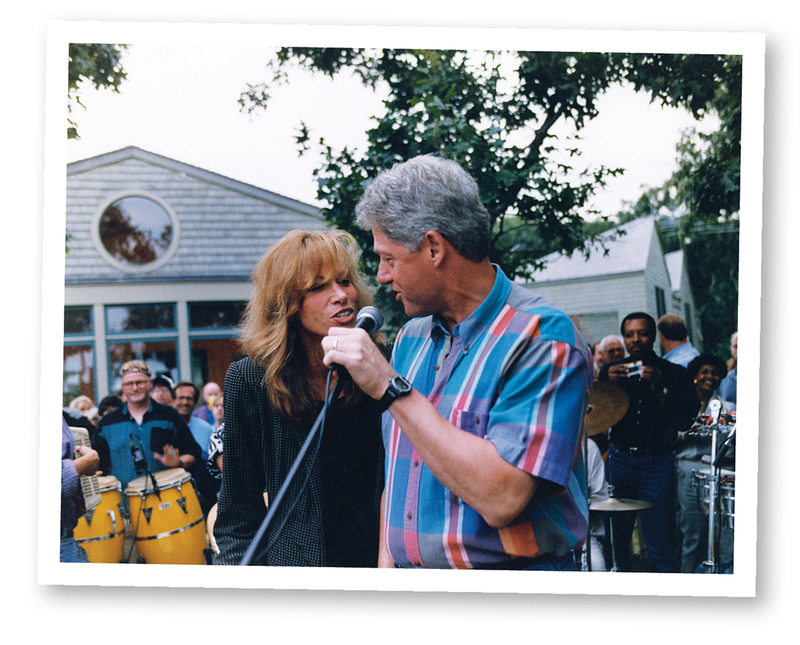 During his numerous stays on the island, Clinton chowed down at clambakes with the likes of singer Jimmy Buffett and novelist William Styron, sang duets with Grammy winner Carly Simon, and attended events with Bill Gates and Sylvester Stallone. Obama’s visits, though decidedly lower profile, have included cameos by basketball star Ray Allen, former Governor Deval Patrick, and former UBS exec Robert Wolf. No big deal. … and with each other. Want to make a tiny island feel even tinier? Invite two presidential families to visit at the same time. 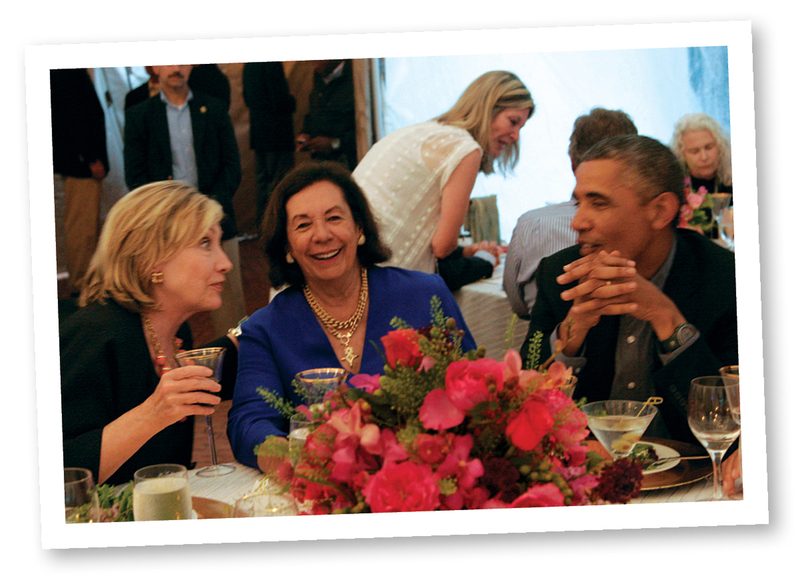 Just days after criticizing her former boss’s stance on foreign policy, Hillary Clinton crossed paths with Obama during overlapping Vineyard vacations in 2014. The two were seated together at a dinner hosted by civil rights leader and former presidential adviser Vernon Jordan. #Awkward. Ever the diplomats, the Clintons and Obamas reunited on the island again a year later, this time for Jordan’s 80th birthday party. A star-studded event attended by actor Morgan Freeman and writer Henry Louis Gates, the bash also included toasts by the presidents past and present. They spend like drunken sailors. From flights to hotel rooms to meals, vacations are a pricey proposition for even the most frugal traveler. When you’re the president, of course, those expenses tend to add up even faster—especially when you’re rolling with an entourage of bodyguards who also need to be fed and lodged. Ahead, a by-the-numbers look at Obama’s Vineyard vacations. Time that police reportedly responded to noise complaints at a rental home full of partying Secret Service agents in 2011: 2:23 a.m. They tour lighthouses with their kids. 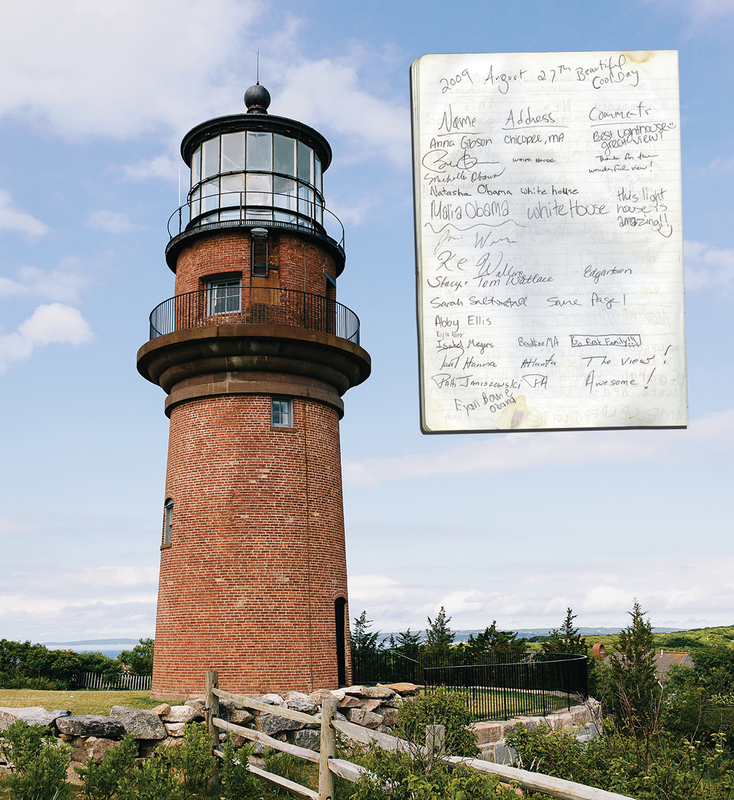 As the keepers of Gay Head Lighthouse since 1989, Joan LeLacheur and her husband, Richard Skidmore, have taken many families for tours over the years. But they’d never before welcomed a head of state and his two school-age children up the ladder—until a sunny day in August 2009, when Barack, Michelle, Sasha, Malia, and a gaggle of Secret Service agents paid a visit to the historical Aquinnah property. With her husband out of town, LeLacheur flew solo with the first family, bringing the kids, and then Barack and Michelle, all the way up to the light room to take in the breathtaking views of the cliffs and the sea. Mentioning how beautiful singing sounds in the space, she asked the president if he would like to belt out a tune—to which he replied that Michelle would kill him if he did. As the family began their descent, LeLacheur called back to them to sign the guest book—a page of which you can read for yourself above.